Do you want to know how to make money writing online? Writers are in demand, and finding work is relatively easy if you know where to look. Making money writing online is attractive: the flexibility, the work seems endless (especially for content writing), you can write about a variety of subjects, and you can work anywhere. With a computer, the internet, and some writing skills, you could be well on your way to earn money by writing online. There are a few things to consider before you dive into making money as a writer. First, brush up your writing skills. Get a solid knowledge of grammar and punctuation, as clients will often prefer work that is complete or nearly complete with few edits. Grammarly is a free service that can aid you if you need it. Decide your niche, or what you want to write. What are you passionate about? Do you have experience within a particular subject? If you don’t have a niche, it’s ok! Many websites will allow you to write content on just about anything! This makes for good practice and will enable you to test the waters if you’re beginning to write for money. Be active on social media. Clients want to see that you are a real person. Facebook or LinkedIn are top places to consider maintaining your social media presence. Set up a professional email address. Having an email address specifically for your writing jobs keeps everything organized. Decide your rates, especially if you’re a professional or an expert in a field. When you begin cold-pitching for clients, they may inquire about your rates. If you’re new to writing online, do your research and see what others in your niche are paying. Familiarize yourself with different payment options. For example, some clients charge per word, some pay per click, some pay per article. Be aware of this before you begin a job. Every online writer should have a blog. A blog is your platform, where clients can see samples of your writing, even if you only write periodically. Similiar to above, deciding your niche in blogging is essential. People who are looking for advice in a particular field or industry can find you if you have a specific niche. Your niche makes it easier to establish your avatar or target market. Your target market is your audience. The topics are endless when it comes to blogging. A blog post will typically range anywhere from 300-3,000 words. Your writing draws people to your site, but you earn money through affiliate links and ads, should you chose to advertise on your site. Find affiliates that work within your niche to appeal to your audience. Blogging is more than writing – building an email list, generate traffic. If you’re wanting to branch out and write for other publications, creating a ‘Hire Me!’ Page on your blog provides clients with your contact information. A ‘Hire Me!’ page lets companies or business, who come upon your blog, know that you’re available to hire for writing opportunities. To get the most out of your blog, it takes more than writing quality posts. Although this is the heart of your blog, being fluent in search engine optimization is critical to bringing in traffic. Search engine optimization (or SEO) is producing traffic to your blog through ‘natural’ online searches (and it’s free!). In other words, when an internet user types in a search, and it’s relevant to your blog, your content should appear on the first page of their results. Keywords are words the internet user is typing in their preferred search engine, like Google or Yahoo. By inserting these keywords into your blog posts, you’re more likely to pull users from their search. Consider, also, starting an email list and sending out a newsletter to stay in touch with readers who are not online as frequently. Businesses that blog do significantly better than those that do not. Every business should consider having a blog on their website. It’s a low-cost expense that reaps benefits, especially if you apply those SEO strategies. Having a blog for your business allows customers to see more about the business, showcases the company’s personality, and can solidify stronger relationships with clients and customers. Not only that, but blogging can help you can analyze your audience, and better understand trends in your industry to appeal to your target market. A company blog can write about anything according to their particular industry. For example, if you own a financial company, writing blog posts on saving or investing money serves your audience by drawing them into your business by reading about your expertise. Try staying on top of the latest news that’s important to your business, so you can better inform your readers and gain credibility with them. Introducing a new product or service your business offers is easy through blogging. Write a post highlighting the benefits of the product or service and post it on your blog, then share it with social media. Social media acquires a larger stream of traffic and potential sales. Blogging is just the tip of the iceberg when beginning to write online. If you’re unsure about your niche, blogging in general, or want to try other options first, here are a few. Guest posting is writing a blog post or an article for someone else’s blog. The best way to guest post is to find bloggers within your niche and see if they have an area for submitting a guest post (could also be classified on their website as ‘submissions’). If not, cold-pitching an idea for a post would be your next step. Guests post don’t always pay; that’s up to the discretion of the blog owner. However, guest posting serves many advantages like drawing traffic to your blog, and this can create potential revenue or help you land other paying writing jobs. Being an author is probably at the top of every writer’s dream. But navigating the hoops in publishing can be tricky. Enter self-publishing. Self-publishing is on the rise. Amazon Kindle Device has made it possible for anyone to publish a book! However, overnight success isn’t guaranteed. The passive income is enticing, but most likely, you will have to write several books to see any significant revenue. You’ll also need to decide what to write. Fiction or nonfiction? If you have an established blog, self-publishing a book about your niche is a no-brainer and a natural next step in your blogging journey. If you’re interested in writing fiction, do some research on the genre to see people are reading. Copywriting is probably one of the most lucrative ways to make money writing online, and one of the hardest to break in to. Copywriters write copy. That is, they write for people to take action concerning their clients’ product or service. Writing good copy takes skill if you don’t already have persuasive skills, you may need to invest in a course or class to understand the craft. Although, if you work hard, your ROI shouldn’t be a problem, as some skilled copywriters can easily generate a six-figure income. If you don’t feel like investing or are not sure if copywriting is for you, apply for Get A Copywriter first and go from there. Free job boards like Craigslist and ProBlogger often post jobs for writers. Many of these are remote, but some are not. Read through the entire job description before applying. Thumb through that stack of magazines in your recycling bin and see if they accept submissions. Check their online site to see if they have a ‘call to submissions’ page. Your local paper may be looking for local voices, so pitching to them is a great way to get exposure. Whatever you do, take the time to craft a great pitch. Editors will be able to tell if you wrote a spray-and-pray email. Create a free profile on Contently.com and let the clients come to you. Fill out your profile with writing samples and skills and see what comes your way. Content writing is a hot topic and quickly growing field in the freelance writing world. Businesses are looking for writers to write content to build credibility and lure customers or clients. Content writing is writing to inform. Businesses need quality articles, blog posts, papers, or other writings written for them. Making money writing content for companies is doable, but tough when you’re starting out. Freelance writers do best when they write about a specific topic. Content writers need to be well-versed in SEO (search engine optimization) strategy and understand the target market in-depth. However, some websites, like iWriter, make writing content accessible and comfortable. If your a business with a blog and need content written, that’s relevant to your industry, that’s entirely possible. What Does It Take to Be a Good Content Writer? If you think you have these skills, try your hand at content writing! The term listicle is almost exactly as it sounds: it’s an article composed of a list. It could be Top 10 Thing Not to Take on Vacation or something similar. The more out-of-the-box, the better! Websites like Listverse and Top Tenz pay writers for unique top ten listicles. Freelance writing sites are a great place to get your feet wet writing online. You gain a perspective of how freelancing works, and if you land jobs, you may be able to add that work to your portfolio. One caution with freelance writing sites: they’re competitive. Many people are just starting to make money writing online start here. However, if you’re an expert in your field, sometimes you can land higher-paying jobs. Companies are often looking for people with expertise. Low-paying jobs are likely when you first start out trying to earn money writing online. Don’t be discouraged. Once your more familiar with the landscape of freelance writing and you have samples in your profile, you can set your rates. And, the exposure and experience are invaluable. Did you enjoy writing 10-page essays in high school and college? Essay writing services are an option for you. Big-dog websites like The Huffington Post or Buzzfeed also accept personal essays, though maybe a little of a stricter client to clinch. Not into writing to inform or blogging? Good at storytelling? Write fan fiction! Amazon Kindle Worlds will pay you to write stories about your favorite TV characters. The work is available for people looking to make money online writing. Choosing your niche and mapping out your plan can help you take your first steps into the writing profession. 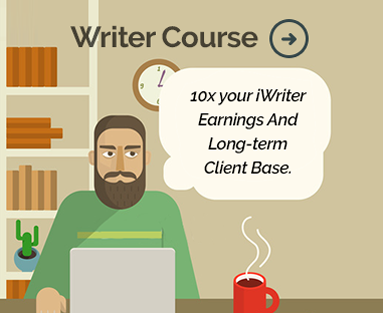 One of the best places to begin for writers and businesses looking for content is iWriter. For writers, iWriter helps you to start building your clientele, work at your own pace and you choose your focus. With weekly payouts and opportunities to advance, we’re the top website that employs writers. Visit our website to learn more. For businesses, iWriter writes ebooks, articles, article re-writes, blog posts and more on your topic. Eliminate some of the hard work and order content. The more you write, the better you’ll get, and the better you get, the more clients you’ll have. Pick a topic (or more!) and get started making money writing today!